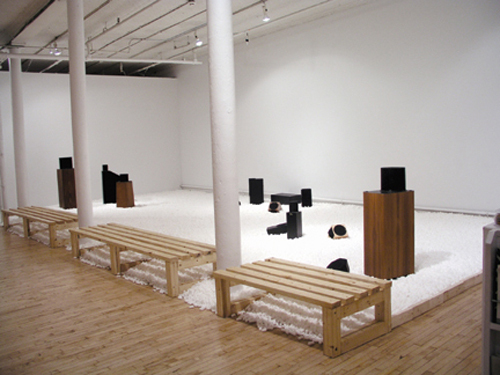 Rock's Role (After Ryoanji) installation view at Art in General (New York), 2004. A sound art exhibition conceived as a “garden,” where works overlap and interpenetrate. The exhibition title recalls a series of works by John Cage collectively entitled Ryoanji, in which a separation of continuous and discrete aspects of sound is enacted. These works are musical transliterations of the renowned Zen rock garden, of the same name, located in Kyoto, Japan. Rock’s Role is curated by Ron Kuivila and includes sound works by: DJ B, Gabriel Burian-Mohr, Damian Catera, Rilo Chmielorz, Bernhard Gal, David Galbraith, Mike Hallenbeck, Barbara Held, John Hudak, Brenda Hutchinson, David Matorin, Andrew Neuman, Maggi Payne, Michael Schumacher, Masahiko Sunami, Ed Tomney, Stephen Vitiello, and Lauren Weinger.